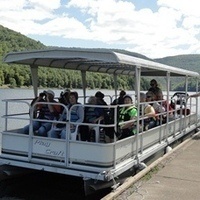 Join park staff for a relaxing and informative 1-hour tour, as we cruise the shoreline of the George B. Stevenson Reservoir in search of wildlife. Group size limited. Donations requested. PRE-REGISTRATION IS REQUIRED. Interpretive tours are offered on selected Sundays, May through September, at 10:30 AM, 12:00 PM, and 1:30 PM. Interpretive pontoon tour dates for 2018 are May 6, 20, 27, June 3, 17, July 1, 15, August 5, 19, and September 2, 16.